Nothing is more curious than receiving an invitation to a country you need a dictionary to spell and an atlas to locate. 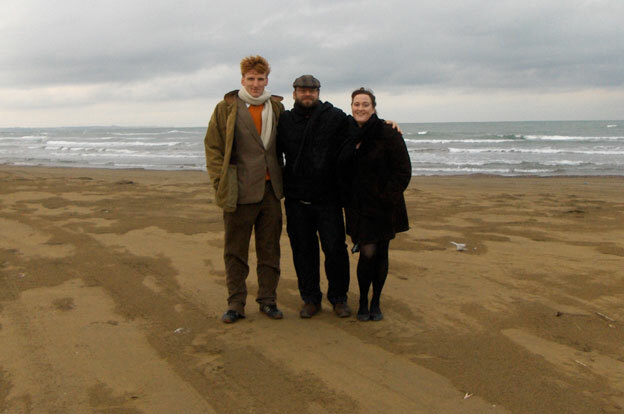 Such a wonder befell me early in 2008 when I heard word of a reunion of journalist friends taking place in Baku, Azerbaijan, the oil port on the Caspian Sea. A quick aside: I have often had the good fortune to find myself amid motivated, creative, and dynamic individuals. As chronicled in my memoir, this happened rather publicly at the Shakespeare and Company bookstore in Paris. But long before, this same phenomenon occurred in university. I attended Carleton University’s journalism program, which claims to be the best in the country, the Columbia of Canada if you will. In that program, and at the university’s student newspaper, The Charlatan, I fell into a brilliant circle of rambunctious and talented friends. We served as whetstones for one another, sharpening each other’s ideas and writing, preparing each other for the cutting ‘real world’. It was the pull of these old friends that brought me to Baku. Or, rather, this chap with the cap, the beard, and the lovely Irish girlfriend who can be seen here posing at the Zoroastrian fire temple. Michael Mainville and I were editors together at the university newspaper, we lived in the same building for a year or two, and we spent many an evening hoisting an immodest number of pitchers of beer. After graduation, Mike’s journalism voyage took him from Montreal to Prague to Moscow to today, where is he is the Caspian bureau chief for Agence France Presse based in, yes, Baku. 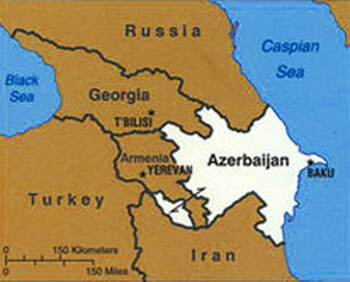 What do I now know about Azerbaijan? It is squeezed between three intimidating powers – Turkey, Russia and Iran. It has been carrying out an angry civil war with its neighbour Armenia for years. It is renowned for its caviar and on the black market you can buy a tin of the stuff for 70 euros that sells for 1,500 euros in Paris. And, it was once an important route for Zoroastrian pilgrims meaning the country is home to Zoroastrian temples like the one pictured above. Oh, and the country is oil and gas rich, which means the economy is incandescent and the landscape is pimpled with derricks. 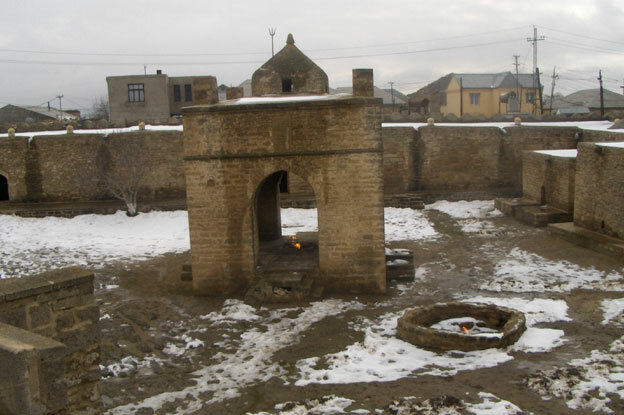 Interestingly, one of the reasons the Zoroastrians felt this place to be holy was the eternal flames that burned everywhere, the result of lightening striking surface gas deposits. These had burned for centuries until rampant exploitation (like that by these derricks seen from the rampart of the temple) meant that the level of gas slowly sunk and there was no longer enough at the surface to keep the eternal flames burning. Now, the temple has a gas pipe running into the sacred fire pit and when visitors like us arrive, a guard hurries off to turn on the gas and then throws a lit match into the pit. This made the whole Zoroastrian experience slighlty less mystical. Still, one can’t dismiss the profound impact the oil and gas exploitation in Azerbiajan has on the soul. For example, the Nobel family made a bit of its fortune here and and least one of the clan went on to endow humanity with its most prestigious awards. 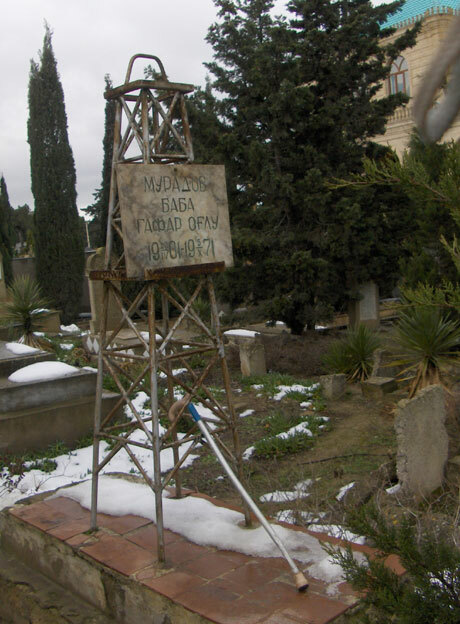 And then there was this fellow, who decided that nothing could better mark his moment on earth than a derrick as his gravestone. Baku itself reminded me of Beijing for two reasons. First, the thick pollution. 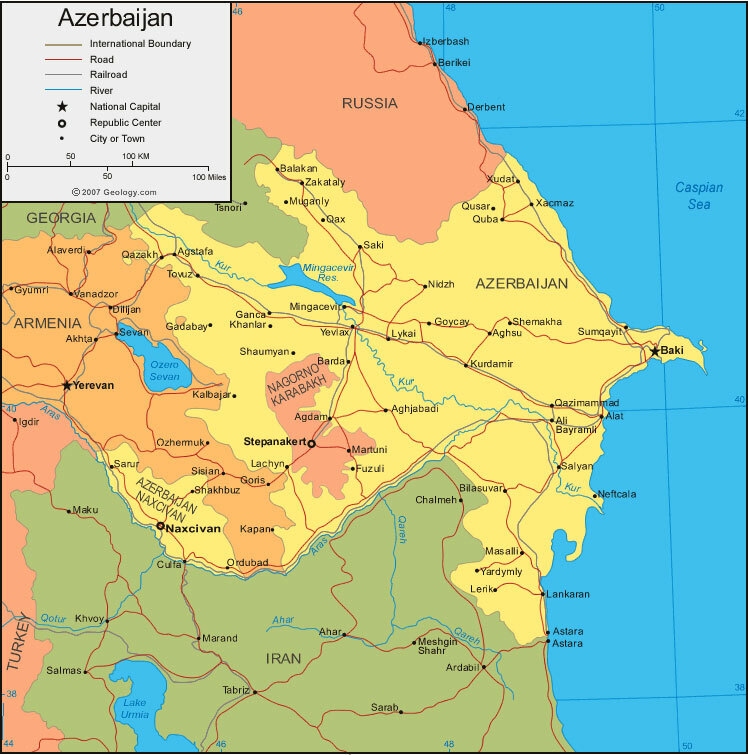 (This isn’t entirely the Azeris fault; when the country was under the heavy thumb of Russia, it was victim to the Soviet policy of placing the foulest industries farthest from the heartland, meaning there is an array of spewing factories along Azerbaijan’s Caspian coast.) And second, the rampant construction.The surge in oil wealth has led to the inevitable SUVs and rash of condo projects. Above is but one example, but I beg you to note something of much greater interest in the photo: the statue in the foreground. 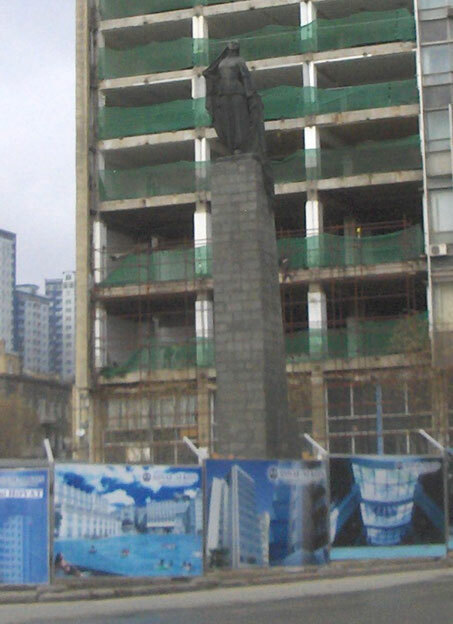 Azerbaijan is a secular Muslim state and this sculpture of a woman tearing off her veil celebrates the emancipation of women. Of course, the country is a dictatorship, which cramps one’s style a bit. Freedom of the press for Azeri journalists? Hah! Who needs it? Sadly, if you think it is important, like the crusading journalist Elmar Hüseynov did, you might end up dead like he did. The framework for this sort of brutality can be traced back to Azerbaijan’s days as a Soviet state, but they were enthusiastically continued under dictator Heydar Aliyev who came to power in the mid-’90s. He’s dead now, but the city is full of billboards like this one that pay homage to him. 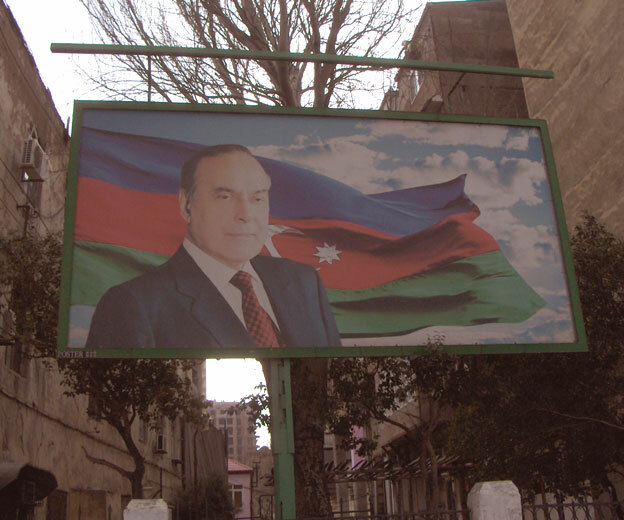 The propaganda campaign is the work of his son, Ilham Aliyez, who is the current dictator and wanted to both honour his father and emphasize the authority of the Aliyev name. 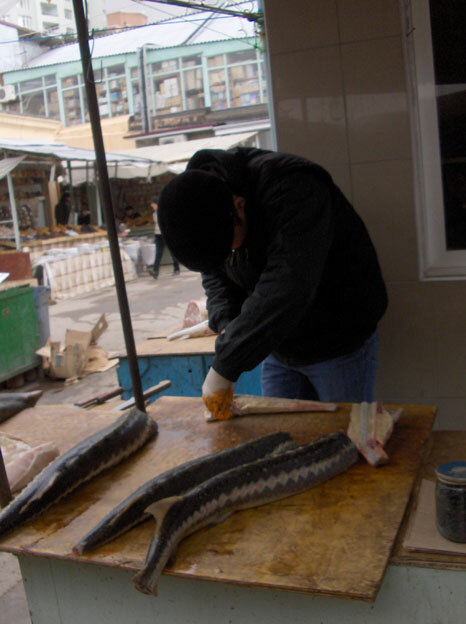 On the bright side, they have tasty sturgeon! So that was the tourism. Then came emotional melodrama. These are the other two guests at the reunion. Mark MacKinnon is a high flying foreign correspondent who is currently based in Jerusalem and gets issued super-sized passports to accommodate all his visas and stamps. 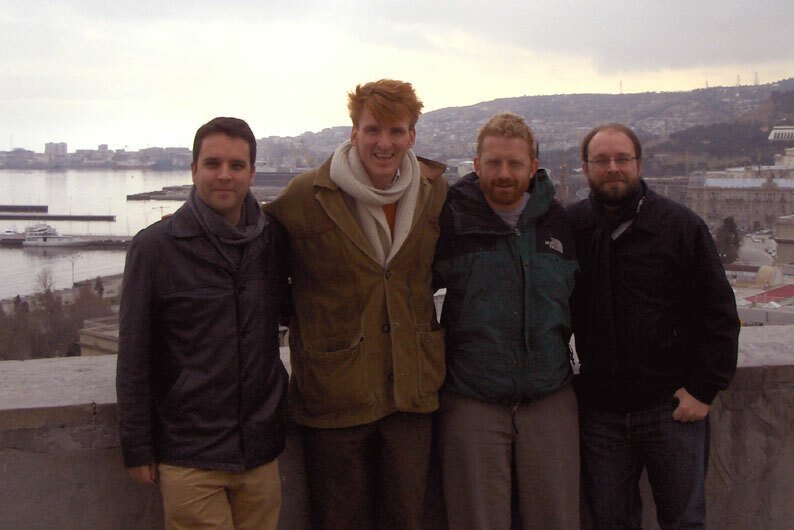 Colin Freeze is a terrorism reporter who arrived in Baku after six weeks in Afghanistan. 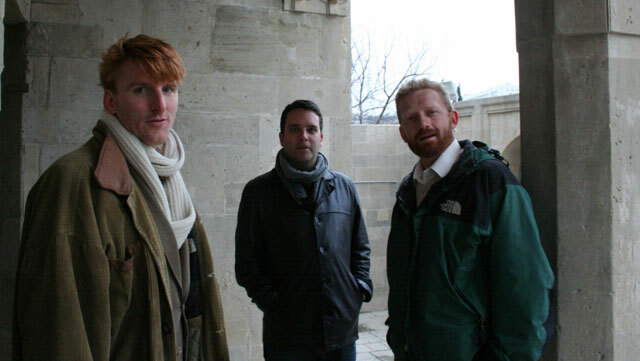 So, for those of you keeping score at home, that’s three intrepid and glamorous international reporters and one layabout author who spends too much time taking siestas in the south of France. Cue career crisis on the part of the layabout. Certainly, most days I feel fulfilled and productive – but when was the last time I was in a war zone? 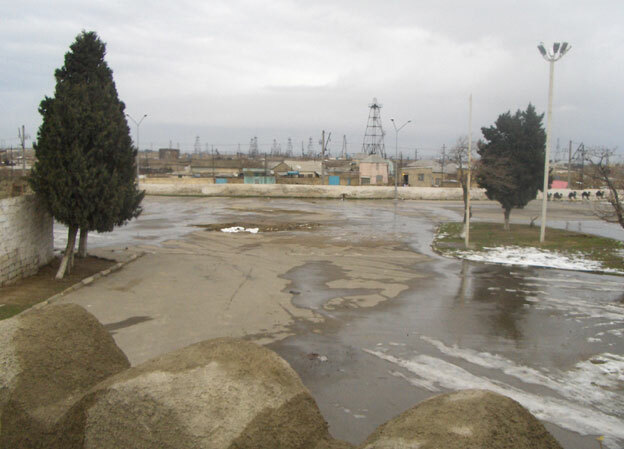 Mike covered the Beslan school hostage-taking in Russia that ended in hundreds of deaths; Mark has had Israeli helicopters force his car off the road; and Colin was arranging a flight back to Kabul to search for terrorism suspects. They are at the epicenter of world events, and they have a voice in those events. Suddenly, my life felt dull and for the first time since I left my newspaper I wondered, What if? Might I have been in Iraq or Sudan if I had continued on that path? Then there was the fact that we were four highly charged and highly competitive men, one of the reasons we had each gone on to enjoy success in the difficult worlds of journalism and publishing. Put four such men together in a room with lots of Azeri beer and things are bound to get chaotic. It all wasn’t blood and doubt however. We also went carpet shopping. And here, we all must really tip our hat to Samantha, who is pictured above enjoying a cigarette. She not only remained charming and gracious while four men drank and debauched around her, but she was only mildly alarmed by the blood on her Persian carpets. Well done Mike, she’s tremendous. 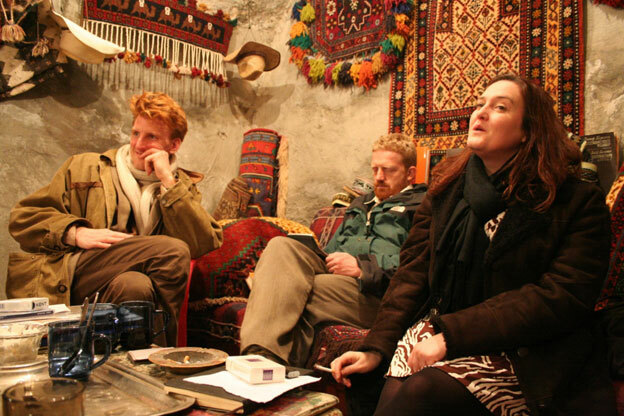 The vital thing is that at the end, when we all went our separate ways – Mark to Gaza, Colin to Kabul, Mike to Armenia, and me back to the south of France – we were all going to the places we wanted to be, the life we had each chosen, and we were each happy to be doing so. Of course, it took me a few weeks to come to such a wholesome conclusion. At first, I just felt miserable and ineffective, I worried that I was wasting my life, that I should quit the easy pleasures of the south of France and engage once more with the hard, cold, cloudy world. 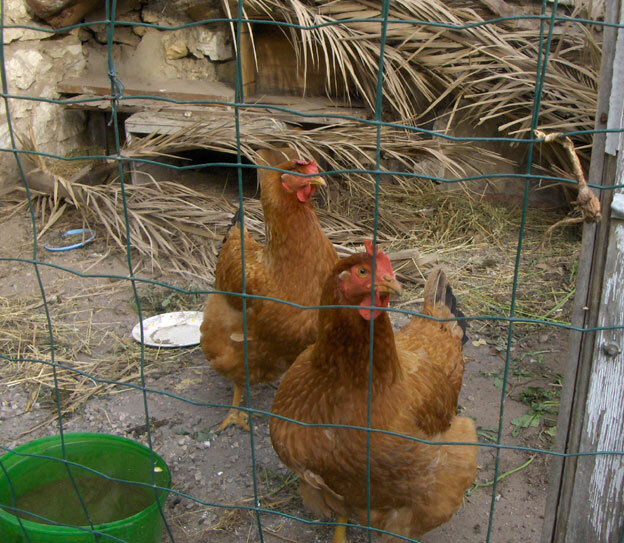 Instead, I decided that when in doubt, double down, so I stayed in Marseille and bought chickens. I mean, if I am going to lead a quaint life in Provence, I might as well have livestock, right? I am pleased to say I am now getting about 10 eggs a week.